Dot marking systems are the ideal solution in a rough, tough industrial environment where the more sophisticated precision of laser markers may not be so appropriate. Our product partners, Richter, offer a range of marking, scribing and engraving machines that are not only robust but affordable, flexible and easy to use. Richter systems can be fully integrated within existing production lines. However, the company has also developed the capability to design and build a whole production line section from scratch specifically to optimise the dot marking process. This is a unique service, closely integrating the marking heads with the manufacturer’s handling system requirements. 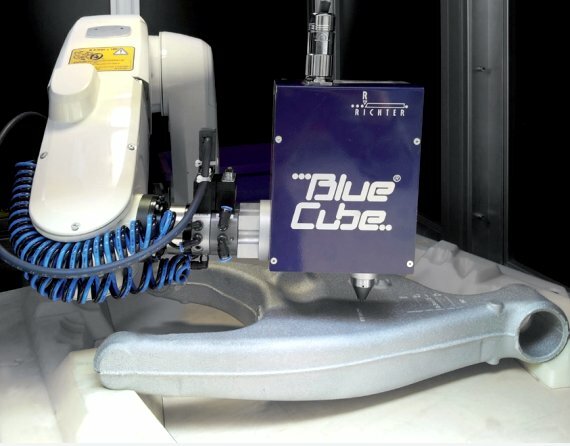 BlueCube is the latest model to join Richter’s dot marking systems for integration and automation. It is an especially small and lightweight dot peen marking and scribing system designed for use in satellite system robots or handling axis. Control is via a standard EM100 controller (includes labelling software, Signumeric and Ethernet interface) or PC or an optional PCA controller. It has a marking window of 60x30mm and a marking speed of up to 6 characters a second with a repeatable accuracy of 0.2mm. To meet individual requirements, there is a range of accessories including a rotary device, available in a choice of sizes for marking cylindrical and polygonal components. The BlueCube system is ideal for the process of reliably labelling graphics, data matrix codes, time or shift labels as well as automatic dating. Marking involves free scaling of character height and width, marking depth is individually adjusted and there is ample scope for different fonts, special characters and logos.